The federal Health and Human Services Department will inspect if New Mexico is properly serving New Mexicans in need of mental illness and addiction services. The review by the Inspector General of the federal Health and Human Services Department, confirmed in late June and made public Friday afternoon, comes roughly four years after Gov. Susana Martinez’s administration disrupted care for tens of thousands of New Mexicans when her Human Services Department accused 15 organizations of Medicaid fraud and potentially overbilling the government by nearly $36 million. Citing the fraud accusations, the Human Services Department suspended the flow of ‘behavioral health’ Medicaid dollars to many of the organizations in the summer of 2013. Unable to stay in business without the Medicaid dollars, many had to shut their doors and are no longer in business. Ultimately no Medicaid fraud was ever found. And the estimates of overbilling Medicaid have been dramatically reduced; in one case, the state reduced to $484.71 what it said Las Cruces-based Southwest Counseling Center owed after accusing it of overbilling Medicaid by as much as $2.8 million as recently as January. 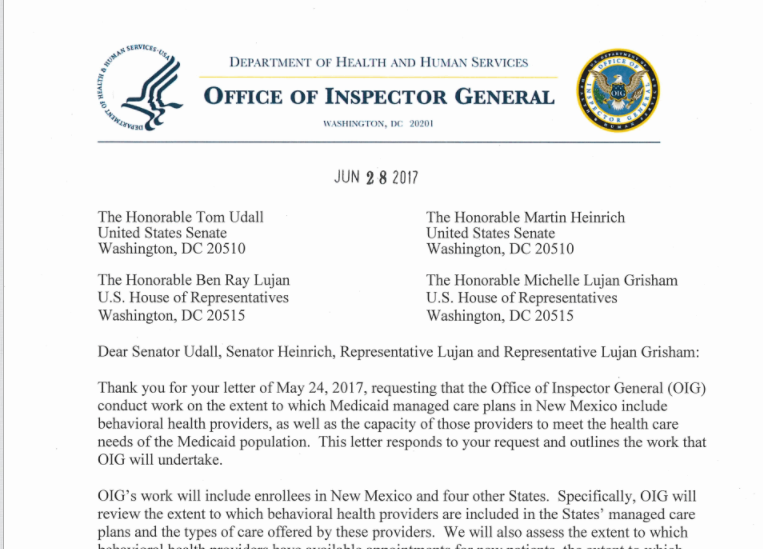 The Inspector General of the federal Health and Human Services Department confirmed the review to four members of New Mexico’s congressional delegation in a June 28 letter made public Friday afternoon. The IG’s letter was in response to a May 24 letter U.S. Senators Tom Udall and Martin Heinrich and U.S. Reps. Michelle Lujan Grisham and Ben Ray Lujan, sent in May to the federal agency asking the Inspector General to perform the review. ‘This led to the closure and partial replacement of accused providers, all of whom were later cleared of wrongdoing by New Mexico’s Attorney General. This move decimated the behavioral health system in a state where there are already significant provider shortages, and almost four years later, significant access issues remain. “OlG’s work will include enrollees in New Mexico and four other States. Specifically, OIG will review the extent to which behavioral health providers are included in the States’ managed care plans and the types of care offered by these providers. We will also assess the extent to which behavioral health providers have available appointments for new patients, the extent to which behavioral health providers have waiting lists, and the extent to which behavioral health providers are able to make referrals to other behavioral health providers for needed care. Albuquerque’s mayoral contest is officially a $2 million race, setting the stage for the most expensive mayor’s race ever in the city. Campaign finance reports filed today show mayoral candidates have raised or otherwise accumulated $2,103,107 since the beginning of the year.